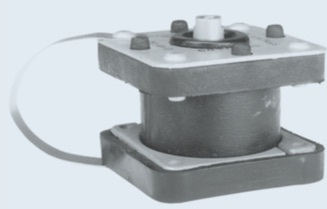 Two stage shock mount and vibration isolator for severe dynamic environments such as shipboard and ground vehicles. 2KS Series for loads from 250 – 6,000 lbs. 2K1 and 2K2 isolators are for use with lightweight MIL-S-901 applications. 2KS systems are for use with medium weight MIL-S-901 applications. Isolators and systems met MIL-STD-16400 inclination, temperature, humidity and salt spray specifications, MIL-STD-167 vibration tests and MIL-M-17185 environmental and oil immersion tests. Isolators are unaffected by humidity, sand, dust and fungus. TRANSMISSIBILITY AT RESONANCE 2.5 Max. 10 Max.